King Henri II’s mistress is shown as Diana, classical goddess of hunting. Her monogram appears on the white hound beneath her foot and in the centre of her name. The romance of the French Renaissance court appealed to the Rothschilds, who specialised in collecting Limoges enamelled portraits of this type. Painted Limoges enamel plaque; copper, oval; convex with moulded edge; Diane de Poitiers in a chariot drawn by lions; inscribed; background, a hunt with 4 dogs chasing a stag through trees; signed; translucent enamels over coloured foils and direct on the copper; semi-opaque enamels over a white preparation and grisaille; painted with flesh tones, stippled and features produced by enlevage; gilding; counter enamel transparent and colourless, with murky purple flux. Provenance: Baron Anselm von Rothschild, Vienna, between 1866 and 1872 (cat no. 482), by inheritance to his son Baron Ferdinand Rothschild (d. 1898). Commentary: As Henri II’s mistress, Diane was a powerful influence at court from 1547 until Henri’s death in 1559. Her monogram, the interlaced DD, appears on the white hound beneath her foot and in the centre of the name Diane. There is a plaque at Waddesdon manor signed 'LL' with Cybele on a similar chariot (inv. no. WI/77/I) which is after a print of Cybele by the Master of the Die. For a scientific analysis of this plaque and comparison with a plaque in the Wallace Collection (inv. no. IIIF240) which may have been made in the same workshop at around the same time, see Higgott 2011 (in bibliography). 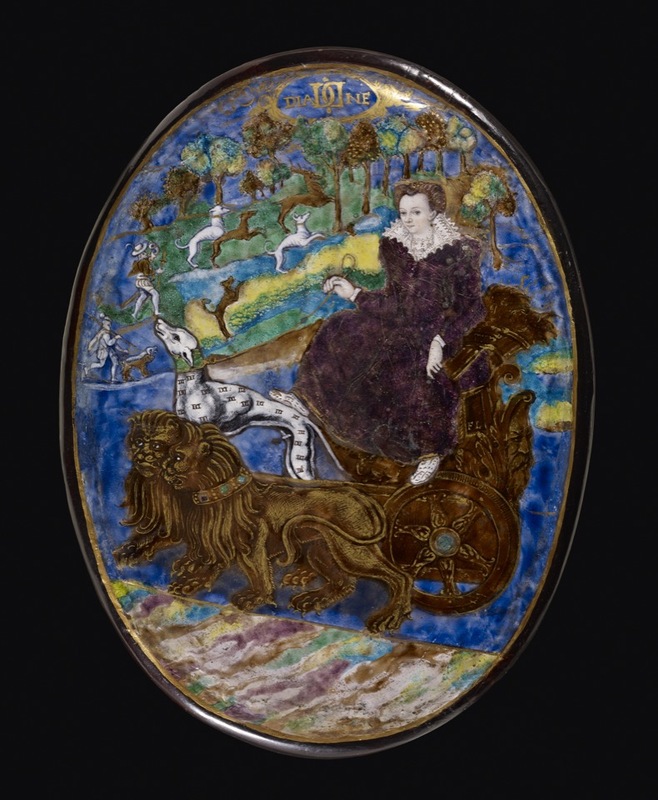 Suzanne Higgott, 'Catalogue of Glass and Limoges Painted Enamels', The Wallace Collection, London, pp.270-273, fig. 74.4.